BYL Network, Inc. was created to entertain, educate and better the lives of people around the world. With today’s every changing world of multi-media products, services and technology, our mission is to produce, curate, filter and broadcast quality content about real people, real life and real solutions. Currently, we broadcast content across 6 channels for and about Women, Men, Money, Home & Travel, Sports & Entertainment and a Late Night Channel. 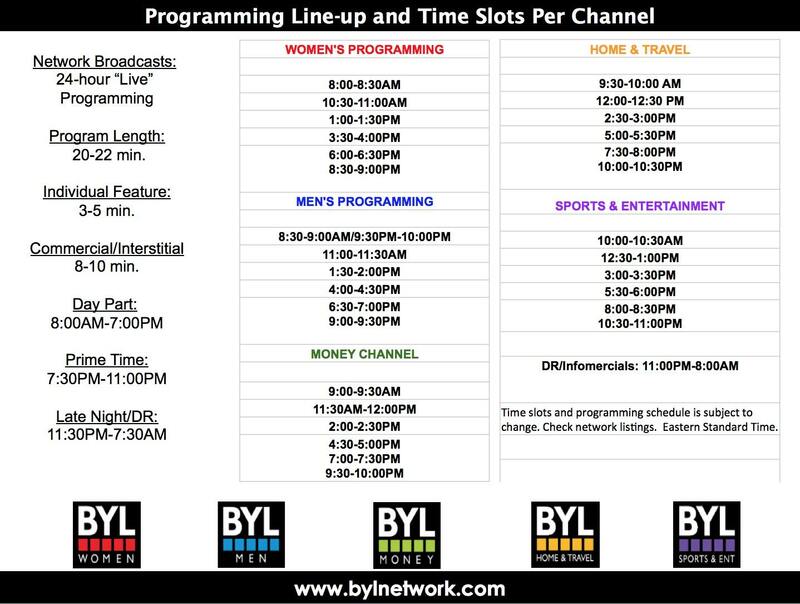 Below is a broadcast schedule and programming line-up. If you are interested in sharing a story or video for us to broadcast, register a channel to start uploading and sharing content for us to review. BYL Network, Inc. is located in Boca Raton, Florida. We currently offer multi-media services consisting of online video broadcasting, broadcast software management, publishing, marketing and special events. For questions or more information, please email info@bylnetwork.com or call us at 561-487-3690.